And while this time of the year can be a time of great joy, it can be a time of great stress for many. “We’re always worried about ‘What do we give our friends?’ ‘What do we give our loved ones?’” noted Franklin Graham, president of Samaritan’s Purse, in the video introduction for his organization’s Christmas Gift Catalog, which features gifts that help and provide for persecuted Christians, missionary workers, and needy children, mothers, and families. 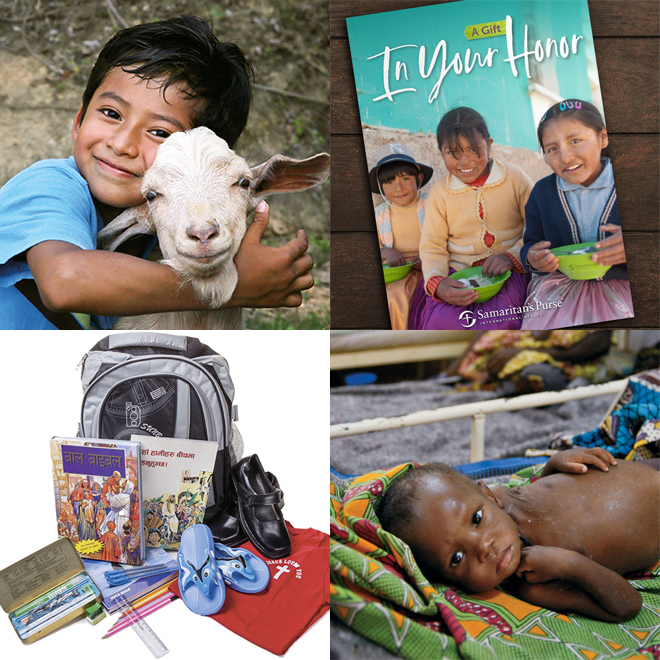 Like most other gift catalogs of their type, Samaritan’s Purse’s catalog features gifts of various price ranges – starting from as low as $5 (the price to bless 10 children with a colorful, child-friendly Gospel booklet that illustrates Christ’s life, death, burial, and resurrection) – and they can be purchased in a loved one’s name. Shoppers can also choose to send a personalized card describing the gift and its impact. Below is a list of organizations that have gift catalogs, along with some sample gifts. All organizations below are members of NRB. Sample Gift: Bathrooms and Hygiene Training at a Compassion Center ($60 per child) – This gift will (1) help a Compassion Center construct a new bathroom facility with sinks and showers, (2) provide sanitation and hygiene training for the children, and (3) improve health for these children and hundreds more in the future. Sample Gift: A Goat to Give Milk ($90) – A goat requires little maintenance, and their milk provides poor families with nutritious protein and a chance to break the cycle of poverty. Sample Gift: Warm Clothing & Shoes ($25) – Families trapped in poverty or affected by disaster often struggle to provide basic necessities for their children, including proper shoes and warm clothes. Samaritan’s Purse provides clothing for people in crisis situations, helping them stay warm and well in the midst of a harsh environment. Your gift of $25 can help Samaritan’s Purse give a coat, gloves and a hat, or shoes to someone in need and open the door for the organization to tell them about the loving God who “clothes the grass of the field” (Matthew 6:30). Sample Gift: Christmas Care Packs ($30) - Christmas Care Packs are specially designed to encourage the children of our persecuted brothers and sisters in their faith. Along with toys, school supplies, and toiletries, each backpack contains an illustrated children’s Bible and other Christian literature. The packs will be distributed throughout the 68 hostile and restricted countries where VOM works. Sponsor by midnight December 14 to ensure that the person honored receives a personalized note before Christmas! Sample Gift: Medicines ($25) - Every day, thousands of children die because they do not have access to basic medicines that could save their lives. Your gift will multiply five times in impact to help ship and distribute essential pharmaceuticals and medical supplies like antibiotics, anti-fungals, anti-parasitic drugs, deworming medications, disposable syringes, gastrointestinal drugs, painkillers, and surgical supplies.